A5X The A5X is popular among professionals working in television studios and remote broadcast van..
AV32 Overview Upgrade your sound with the AV32 monitor speakers from M-Audio. The acoustica..
AV42 Overview Upgrade your sound with the AV42 monitor speakers from M-Audio. 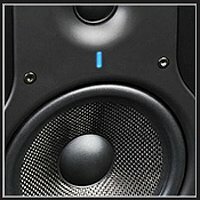 The acoustica..
BX5 D3 Overview Professional Monitoring for any Studio The BX5 Carbon studio monitor helps ..
BX6 Carbon Overview Professional Monitoring for the Home Studio The BX6 Carbon studio monit..